Your life can get hectic. Sometimes you don’t have time to prepare a meal, especially when you want to include all the healthy macro-nutrients. That’s why we created illumin8. Now you have the convenient choice of clean, plant-based protein with a full-amino acid profile, gluten-free carbohydrates to help fuel energy, healthy fats, minerals, fiber, whole-food vitamins, enzymes, and probiotics. Made from REAL FOOD, our meal replacement will fill you up and give your body the nutrients it needs to take on your day. Organic superfoods like baobab, chia, flax, whole grain brown rice, kelp, holy basil, guava, and coconut, have been selected to make this meal replacement more nutrient-dense that most meals prepared at home. 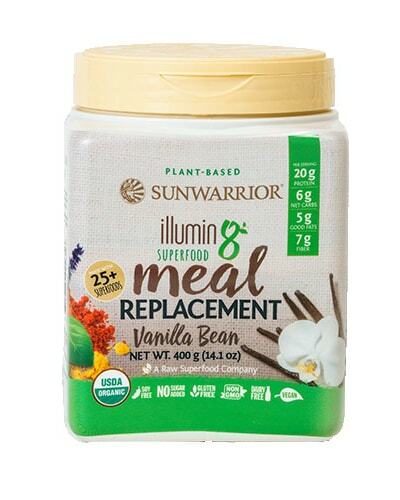 Use illumin8 for a quick shake on the go, or add it to your smoothie for increased cellular nutrition.